Harley Davidson Roadster a sporty ride carrying an 883 cc charged engine on board, strikes the people passing by with its plain harsh racer design. Bred under the 55 year old sportster family line and upgraded with latest technology to uplift its character the bike no doubt can floor any passionate on road speedster. 149 km/hr, the maximum speed the 883 cc engine can deliver is an indicator of the Roadster's caliber. 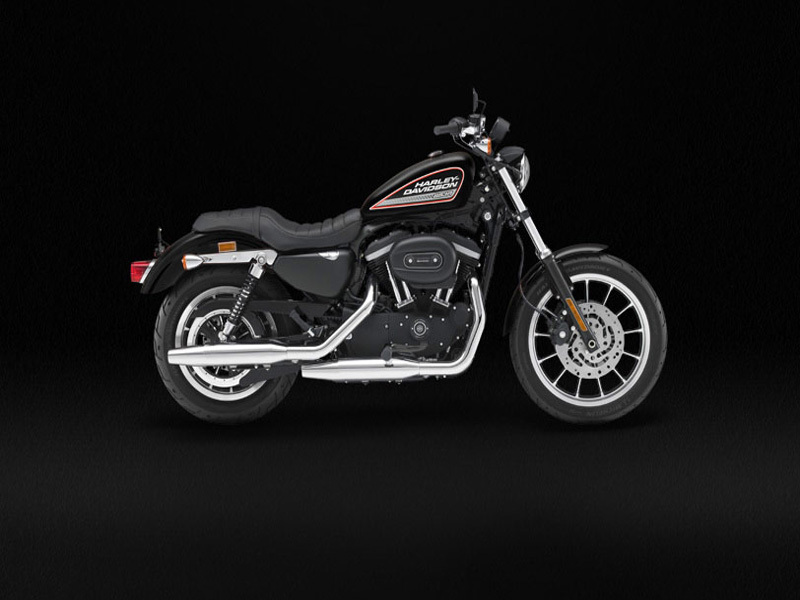 The 13 spoke cast aluminum wheels at front and rear with black fork legs at front, black coil spring at rear, black handle bar and black headlamp cover with chrome rim adds to the tough attribute of the Roadster. 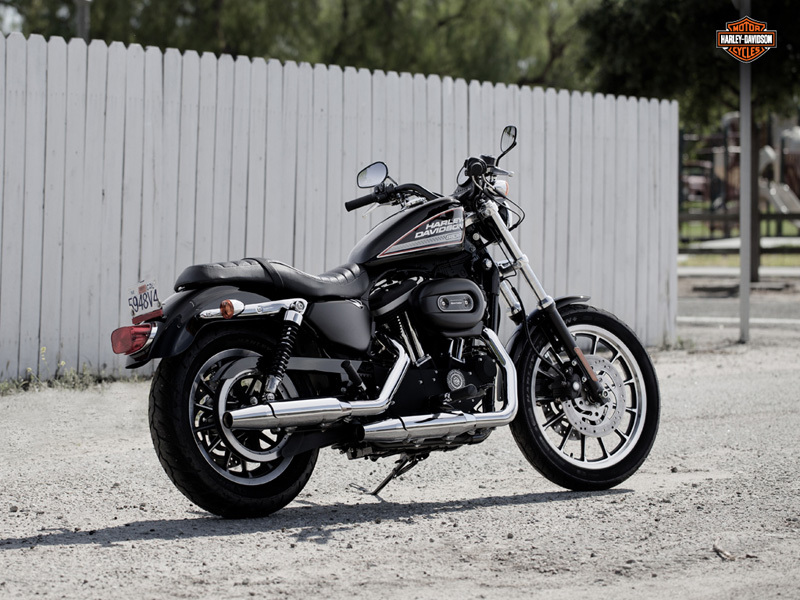 The 883 cc evolution engine has a tale of hard work and dedication from people of Harley Davidson. It is machined out into a jewel and is fit into the Roadster. The air cooled V twin engine with a bore of 76.2 mm and stroke 96.8 mm is light in weight and compact. The valves are actuated by over head valve mechanism. It delivers maximum torque output of 69 Nm at 3750 rpm. The ride on a Roadster powered by this heavy torque at an rpm range of three thousands shows how it can pave its way by accelerating and cruise through the roads. The fins and engine head are all coated in black and it uses a sequential port fuel injection system controlled by an electronic unit. The 883 cc Roadster carries a 12.5 liter fuel tank whose graphics boast of a machine made for race. The brand name crowns the graphics which also has a racing flag design that welcomes a winner at finish line. The tank is of the shape of a peanut is mounted with slight inclination and gets tapered towards the rider. The rider foot pedal is placed just to the front of the rider's position which comforts a racer to ride this quickie. The power house of the Roadster, the engine and transmission assembly cut to precision are given a black casing. The sporty design with an 883 cc engine is given telescopic suspension at front wheels and load adjustable visible coil spring at rear wheels. The dual floating discs at front isolate the heat from getting transferred to the wheels and hence give better braking efficiency. They are held by four piston caliper braking system. The rear is mounted with a disc having two piston caliper assembly. The Michelin tires at front and rear have treads that are cut deep into the rubber compound. The front and rear tires 100 mm and 150 mm wide are designed to carry loads of the range 229 kg to 412 kg can run at speeds of 210 km/hr. The Roaster 883 under ideal riding conditions may run from 19 to 24 kms per liter of fuel. 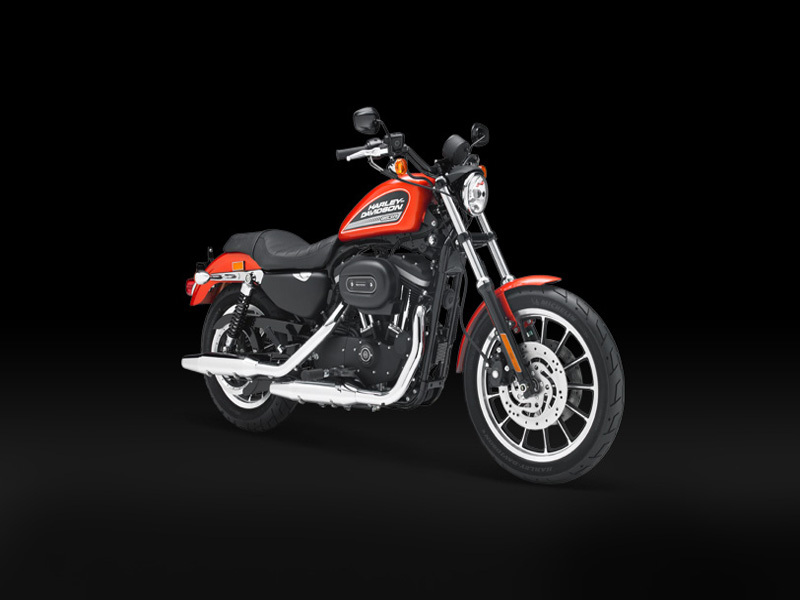 Harley Davidson Roadster 883 costs about Rs 7.65lakhs in New Delhi India. This is the ex-showroom price of the bike.